I found this KUM sharpener on a recent trip to Manchester. Unfortunately the model number is neither printed on the package nor on the sharpener, but it is probably 400-1K. 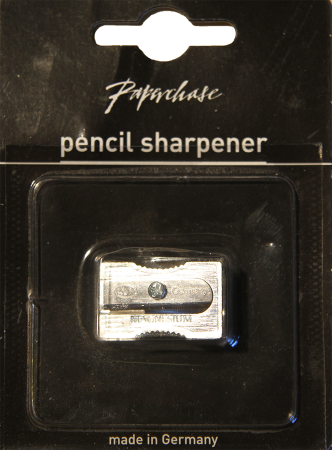 Paperchase in the Trafford Centre sells these wedge-shaped magnesium-alloy sharpeners for £ 0.75 (~ € 0.82, $ 1.12). This does sound quite cheap for a sharpener that can potentially be used for a long time, but for just a few pence more you can get the 400-1E from Cultpens, a similar magnesium sharpener that comes with two spare blades, while the 400-1K does not come with any spare blades. KUM has a very good reputation. 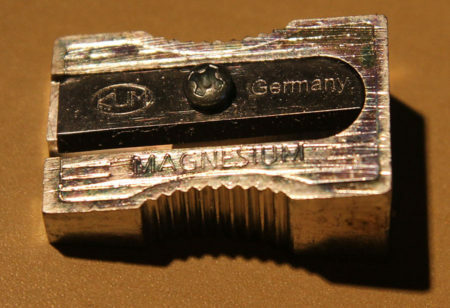 Like most German manufacturers in the pencil and sharpener industry they are from Franconia (more details can be found in the Eisen 402 article). Because of KUM’s reputation my expectations were quite high and I was soon disappointed when I realised that I got another sharpener from this company that does not perform as well as expected. Previous disappointments include the KUM Streamline Chrome Canister Sharpener 460S and the KUM Long Point 400-5L. My only good KUM experience with a sharpener so far is with the Kum Automatic Longpoint Sharpener, reviewed at pencil talk. To sum my problems with the 400-1K up: it does not sharpen the pencils well. The sharpener will produce a long, continuous sliver of shavings, so the blade of the 400-1K is not blunt, but the graphite will end up with gouges or spirals. Good sharpener like the Möbius+Ruppert’s grenade, reviewed at Lexikaliker (Google translation), or the Eisen 402 do not have this problem. The point produced by the KUM 400-1K is rather short and blunt. 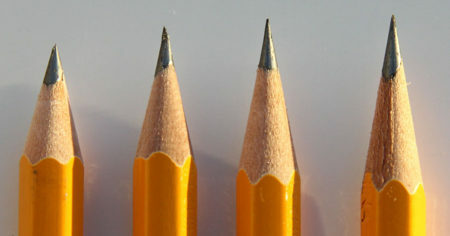 The sharpening angle is only about 24°. Normally you will only get a shorter point if you use a sharpener for coloured leads. The 400-1K‘s point is certainly shorter than the one produced by Möbius+Ruppert’s grenade. 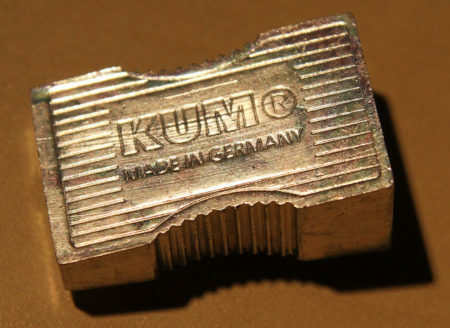 It is nice to have a sharpener that produces a shorter point, but I am not very enthusiastic about the KUM 400-1K. Maybe I got a “bad one”. It does perform similar to other average sharpeners, but you do not have to spend much more to get a good sharpener that will certainly outperform the 400-1K. I would like to thank Kent for the Staedtler 134 yellow pencils used to compare the different sharpeners. I have had good luck with all the KUM sharpeners I have, except this one. I agree; it’s not very good. It’s widely available in the U.S. at Borders. I bought too many, then discovered they’re not good. Yikes. Thank you for this information, Diane. I wonder whether the problem is the blade or something else, e.g. the cone of the magnesium body having the wrong size. Do your other, better good KUM sharpeners use the same type of blade?